Oh my, something furry is living in that pair of boots. Normally, this gal finds Tods delightful and savvy but I change my mind. 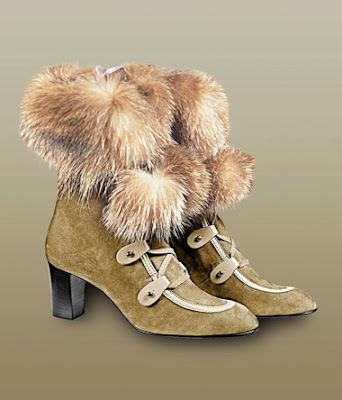 This pair of boots has not only a “fun” fur trim, but also pompoms. This gal has grown out of pompom stage many moons ago. I am going to stop ranting and raving now. In case anyone falls in adoration with the boots, they are available at Tods boutique for $1095. So are fur boots with pompoms savvy or not so much for you savvy gal? Hi there-haha, cute, but not for me!! the fact that derek lam is with tods makes them look better...lol. i just love his creations! Haha... they look good for the winter! i want to get some tods stuff. Ummm...these are like, uptight Victorian lady visits the North Pole. A little weird. They're okay, but I've seen better, and I'd never go for real fur, only fake. egh no. i don't like wearing fur so much anyway, and not like this. not with pompoms. no. i can't find a word to describe it. it's too much. derek lam is the best and i don't mind fur but pompoms just got to me. And they seem to me like a puppy that someone has cute the hair. I;m not a fan...especially for that price! THanks for stopping by my blog. I love finding new places to visit and I generally find them by following people home from my place....in a very non-stalkerish kind of way of course! Oh my God nooo !! I'm a Peta girl !! savvy but i hope it's not real fur. theyre not ugly i think theyre completely hideous. great blog! would you be interested in a link exchange? not a fur girl myself. they would look good without fur do you think?